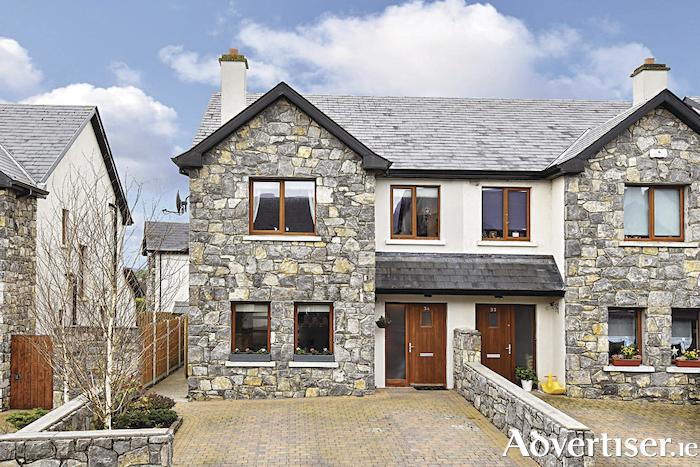 O'Donnellan and Joyce is offering for sale a stunning four bed semidetached home with full attic conversion in the vibrant village of Craughwell. This home is located in the beautiful development of Lána An Bhaile, Ballymore Lane, Craughwell. The property is presented in showhouse condition with careful attention to detail and decor throughout and has full retention in place on the wonderful attic conversion. This property will be attractive to those wishing to experience village life as well as commuters working in or around Galway city and county. The development is located off the main Galway to Dublin road (N6 ) and close to the M6 and M18 motorways, Craughwell village centre is within walking distance. No 34 Lána an Bhaile is located towards the front of this small development, which is an established and integrated community with more than 70 per cent owner occupancy. The development contains a mixture of superior detached and semidetached homes. The property has a beautiful stone cut facade with stone cut walls to the front. The accommodation includes a bright and spacious entrance hall and a sitting room with a feature mains gas fireplace. The heart of the home, the kitchen is open plan with the dining area and both overlook the private rear garden. A separate utility room and downstairs toilet completes the accommodation on the ground floor. The first floor accommodation comprises a main bathroom with feature marble tiled flooring and three fine sized bedrooms. The master bedroom is en suite and also has a large fitted walk-in wardrobe with plenty of shelving and hanging space. All of the bedrooms have solid oak flooring and space for stand alone wardrobes. The property also has the added bonus of a lovely attic conversion with full planning permission in place. The attic bedroom is accessed via a full staircase that leads into a large fourth bedroom with ample storage and an en suite bathroom. Outside the property offers ample off street parking, gated side access, and a private south facing rear garden with a separate timber shed. The village of Craughwell boasts a wide variety of essential amenities needed for modern day country living. Pubs, restaurants, schools, churches, medical centres, and a host of shops are all found locally, while a healthy array of sporting activities can be pursued within Craughwell. Viewing of this wonderful family home is highly recommended and guaranteed not to disappoint. The BER is C2. Asking price is €275,000.